Hey y'all!!! I feel like it's been FOREVER! I missed you guys so much! Last week was such a whirlwind and I am still adjusting to "real" life. I wanted to say thank you to those who dropped by last week while I was gone. Give it up for some amazing guest posts. If it weren't for my girls I would've been 100% MIA. Before I begin, I thought I would mention that this week will be a recap of my trip to London. If this isn't your cup of tea, I completely understand as long as YOU understand that these posts are not to brag or be boastful. It's my online diary that I can share with friends/family and also look back upon over and over again. Now that we have that disclaimer out of the way, here is a recap of out first few hours in London. Our trip started off brilliant (insert sarcasm). Ross left his wallet on the plane. It was recovered minutes later. Then, low and behold, Ross lost his cell phone. Where is it? Think. Think. Think. Oh yes, possibly in the cab. After realizing where he had "misplaced" it, we called our cab and 40 lbs (am I typing that right?) it was was back in his hands. Then we began to hear all sorts of popping sounds. What is that? We walked into our hotel bathroom and my flat iron is smoking like ribs on the BBQ.....yep it caught fire. Our entire room was rank with the smell of burnt hair and ceramic. I was warned over and over again, but no warning could replace the "live" version of this business. Flat iron was toast due to non-compatible outlets. Lesson learned. Advice, buy a cheap flat iron in London!!! The small road blocks weren't going to knock us down. We were staying nearby to the cream of the crop shopping and decided to roll with the punches before dinner with Wallis. Harrods, the mecca of all shopping meccas, was within walking distance of our hotel and we took a few full hours advantage of all the glorious shopping. So, today is all about our first few hours...shopping, eating and taking it all in. I have NEVER seen so many high fashion designers in one block's distance in my entire life...not that I have seen that many sights and sounds. It was true bliss and a jaw dropping experience. Holy wow! I thought I had died and gone to heaven. We stayed at the Millennium Hotel which was surrounded by all the places that I could NEVER afford. Roberto Cavalli was NEXT door to our hotel. Louis Vuitton was outside our balcony room window. Did I die and go to heaven? I truly think I heard angels singing for a short minute. Jimmy Choo and Chanel were across the street. Really? Is this happening? Yes, it was and we felt like a million bucks. This is the FIRST and only time in our entire life. Probably the ONLY time. I am okay with that. If you ever have the chance to visit this incomprehensible city called London, please take half a day to visit Harrods and all it's surroundings. I don't care if you enjoy shopping or not, it IS THE PLACE to be; buildings, architecture, energy, food, shopping, people, photo ops....you WILL DIE!!! So here are a few shots we captured from the first few hours. Did you think out first few hours were going to be spent any differently than with some serious retail therapy and wine? It was London for bloody's sake. If you ever have the chance to travel to London, shopper or not, you must take a stroll hike through this seven story, five acre, one-million square feet, thirty-two restaurant land of amazingness. I am still in awe of it's glory. And after your hike grab some world-famous macaroons from Laduree. They make a fab late night snack, but beware, absolutely NO pictures allowed. I tried to sneak a shot indoors and got busted. These people don't play. Lunch at nearby Caffe Concerto was adorably quaint; delicious sandwiches, salads, brushcetta and a glass or two of wine. It was a romantic and charming little place. I highly recommend. There you go. 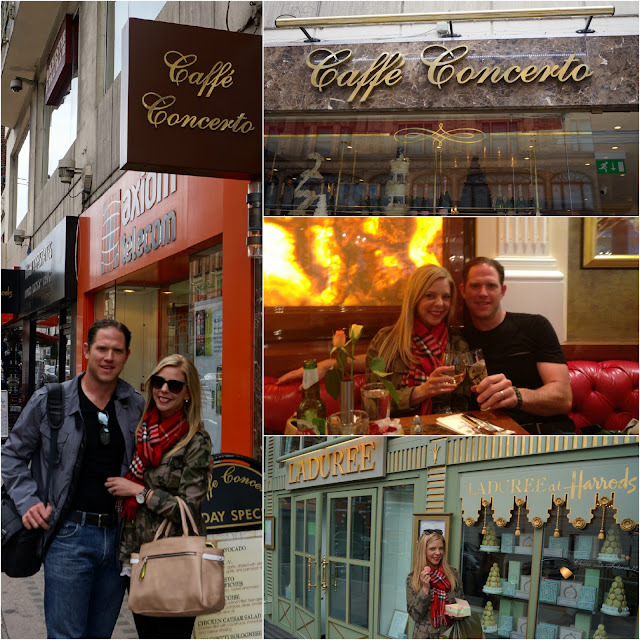 Our first few moments in London town. Stay tuned all week for more outfit posts, travel tips, recaps and some crazy fun during our stay thanks to Wallis. It feels so good to be back in the saddle. I TRULY missed y'all! Wow! What a bumpy way to start but it seems a miracle that the wallet and the phone made it back to you. Yeah!! Bet the hotel was so fabulous. When we went to Europe we used outlet converters. Mj had two and knew about that stuff as he is a seasoned world traveler whereas I'm totally clueless! Can't wait to start seeing all your London buys! Your start sounded like a movie! I studied abroad in London back in college and reading this makes me truly want to hop on a plane and be there. I had the greatest experiences there. I hate the converter- outlets!! I have toasted both a hair straightener and curling iron in Europe...which made for spoiled hair plans. But looks like a fabulous first minutes...despite the roadblocks...can't wait to read more!! Praise GOD Ross got his wallet back!!! Oh my goodness! Your first few hours (after the wallet fiasco) sounded AMAZING. Can't wait to read more! I have been lacking in blogging but I am going to try to visit everyday to read your posts! P.S. I'm going to link you up for MMG. I know you're doing recaps but I want more people to read about this. Obviously, no need to add a link or button!! I'm so happy for you! Welcome back! Your trip looks absolutely amazing! Still, you lost a wallet and cell phone in LONDON. I mean, if you have to do it anywhere lol. You look adorable in the pics, so smiley and excited. Can't wait to hear more! SO! FUN! Can't wait to see the rest of the trip! Let the recap begin!!!!!!!!!! I will devour EVERY LAST POST! Can't wait to hear more! I so can't wait to hear more about your trip! Just so happy for you!!!! glad he found his wallet and phone!! love the red with your outfit. i'm glad you're back - i missed you and can't wait to hear more about your trip! I am SO excited to hear all about your trip this week! You looked absolutely adorable for your first few stops in London :) It looks and sounds amazing Shanna! Sounds like you had a great first day even if it started out a little hard. The first time I went to Germany, I plugged in my hair dryer and blew the power to the entire apartment that we were staying in. Oops. You look fab by the way! Glad to have you back girl! I stayed at the Millennium when I was in London too - isn't is amaing?!!! And if I lived in London Harrods would be DANGEROUS! It sounds like although the trip got off to a questionable start you made the best out of it! I can't wait to read more! LOL, every big journey starts with a dramatic turn! :-) Glad that you had fun and did a great job with Wallis! BTW, loving the camo and red together!! Hope you are having a wonderful day! Sounds amazing! I loved London and would love to go back! And despite living relatively close (the north of France) I still haven't been! Someday though! Eeeek! I'm so excited that you're back and can't wait to read more about your trip! so glad you're back! we all missed you! you looked so gorgeous of course! I can't wait to hear more!! OMG you stayed in my FAVORITE part of London!! I studied abroad there and I lived in Kensington (aka the place I can't afford ever either)! 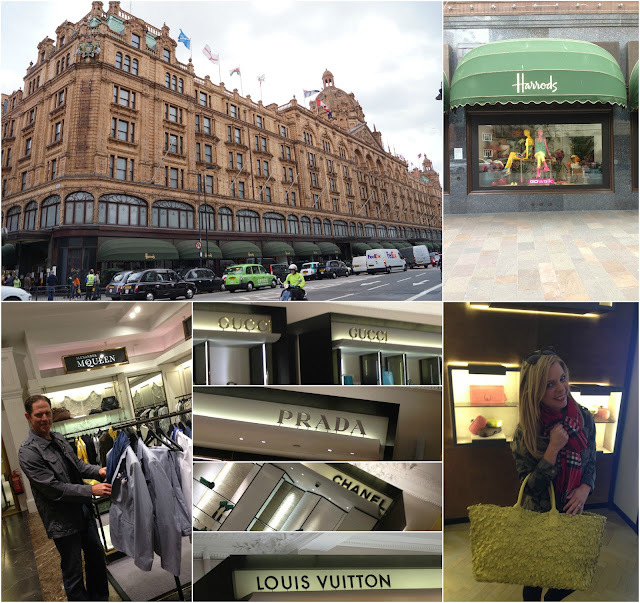 LOVED Harrods. Gosh I miss London SO MUCH. You look fab and sounds like an exciting first couple of hours!!! Looks like so much fun! Can't wait to read all about it this week! I LOVED following your trip on instagram! I was so happy for you the entire time. And I absolutely adore that first outfit. Casual and practical for sightseeing but so dang stylish. Can't wait to hear more!! Aside from the few travel whoopsies, it sounds like a wonderful start! Look looks amazing!! the hubbers and i always talk about going to Europe!! it just looks wonderful!! Yikes! Losing your wallet is the WORST ever, I'm so glad he got it back. Your hotel sounds amazing, and I love the outfit your wore on your first day! can't wait to read all about your trip!!! you looked soo cute!! What's an amazing trip without a few bumps just to get you started and keep it real? LOL, I'm so glad everything turned out OK! Yayy!! Can't wait to read more!! Our trip started bumpy as well when they told us we weren't going to make our connection to Australia...cue running through the airport Amazing Race style! It's those moments that make for good vacay stories, right?! Hey Shanna! :) Your trip started crazy but it turned out wonderful. God is good, no?! Fantastic pictures. Wish we could've all been there with you doll. But Yay! We're all so happy that you could go. What a fantastic opportunity. :) Much affection! sounds like an amazing first few hours! I've never been to London but I'm dying to get there! I love the little bit of lace peeking out! You have to buy a plug converter that also has a voltage converter...the Scot warned me about that. I guess he didn't want me burning down his parents' house or a hotel...haha. If you think you're going to be traveling there more it might be worth it to buy a dual voltage hair iron. I have a little con air one that's served me pretty well. Cannot believe you got busted taking a picture, lol! That would totally be me. love that you didn't let the bumpy start put a damper on things, and holy hell Shanna, lookin' GOOD. The outfit photos are gorg. Welcome back, Shanna! I'm glad Ross was able to get his wallet and cell phone back, yikes. Can't wait to hear about the rest of your trip! Awww Shanna! It looks like so much fun! Sorry about the first struggles. There always seems to be a few things that happen when you travel... but after sounds like a blast! I am completely jealous... London is my favorite place EVER! It sounds and looks like you had so much fun! Looking at this post brings back so many great memories, as I was just in London in January. I even ate at that same cafe! Looks marvelous! Can't wait to see more pics! Omg!! This looks amazing!! I am s happy you enjoyed your trip, hope I get to go visit one day! Your trip looks like so much fun! I love your outfit, the camo and red combo is adorable! Yay! You're back! I sure missed you lol. I am so happy you had a great time! You look so happy and beautiful! Welcome back, lovely! I am so excited to read about your adventures. I wouldn't know what to do with myself in Harrod's. I would probably just sit in the middle of the floor and stare at all the pretty things. You went to Harrods??? Jealous! And your outfit is adorable!!! Eeeee WHAT A DREAM!!! :) Oh, London town. Love that place. Love that last picture of you, too. It seriously belongs in a magazine. Loved hearing about the beginning of your trip! I need a camo jacket now, I'm convinced! Oh my gosh, please tell me you spend some time in the confection shop inside!!! I walked out drooling. Looks like you were in a great part of town - that's the area of London my husband grew up in, near Herrod's! um, i wished we could have switched lives last week! I could have been very content with shopping and eating!! You look fabulous in that outfit like always!! I love the camo + red on you! Great outfit! Power conversion is always iffy outside of the US - I can't tell you how many converters I have bought that didn't adequately work...so many flat irons lost over the years. =) Events like that make for great stories after, though! Ahhh!!! so fun! (not the hiccups at the beginning) I'm beyond jealous, but this seriously couldn't have happened to a sweeter blogger! Congratulations on all your amazing success! Sounds like so much fun. Too bad you guys had such crazy start. Oh the shopping. I would love that. It sounds very much like Japan. I couldn't believe all the high end shopping that could be done there. Can't wait to read more of your exciting trip. am I looking at pictures from a fashion magazine? Seriously Shanna! Those pics of you in the camo jacket on the streets of London... wowzas!! And crazy about Ross. I actually left my passport in the bathroom of a tiny airport in Phuket Thailand... scary stuff being international! I cant wait to hear more about the trip and what you did with Wallis! What a whirlwind! I'm SUPER jealous of your trip, London is way up there on my list of places to go in the near future. I'm in big trouble though with all the high end shopping! Yipes! Goodness, what an adventure! Glad you're home and recovering :) I love the red with the camo, such a great combo! I feel like every trip starts that way! Glad to have you back, can't wait to hear more! Missed you!! I am so so so excited to read all of these posts! My dream trip is to London and the BF and I are currently debating over a beach vacay or a trip to London this fall!! Hopefully this will help to make our decisions :). And that was just the first few hours?! WOW!! Despite the first few hitches this sounds like a dream! So happy for you and I can't wait to hear more!! girrrllll i am so jealous of this fab trip!! can't wait to hear all about it! I would be sniffing every Prada bag there was on the block. I am glad you are back! Love you! So many designers shops!!! Definitely heaven! Loving your jacket! Despite the rough beginning to your trip, it seems like you had a great first day!! My flatiron straight up melted the first time I tried to use it abroad... I was backpacking and had used precious space to bring that thing across the pond, but after it died I had more space for souvenirs... silver lining? Can't wait to hear about the rest of your travels!! Yay! Must spread the word about you!!! Wow, what a rocky start! But it sounds like you made the best of it. I have only been to london once, I went to harrods, but I barely remember it, I was only 11. OH that Harrod's...what a dream. Come to Toronto, I will take you to Holt's so not the same but also fun. I just stumbled across your blog (thanks to the up & coming section of Bloglovin'!) and was so excited to see you were in London - I was JUST there last week on a whirlwind trip and it was so amazing... what a beautiful city! I'm loving your mix of camo & plaid - you look perfectly cozy & cute! Missed ya Shanna! So happy to see what a great time you had. Can't wait to recap the week right along with you! My family and I went to London a few years ago and I MADE them stop at Harrod's one day. I was the happiest woman on the planet to be in that place. I walked in the door and my jaw literally dropped. It is SO amazing!! Can't wait to read the rest of your recap posts! I'm so excited for all of your recaps! I was super concerned about the start of your trip, but it sounds like it all worked out. I love the camo and plaid together! you look amazing and despite the bumps along the way (at the beginning) it sounds SO magical!!! Oh my gosh, all of this amazing shopping all in one area!!! I would have screamed in excitement! !